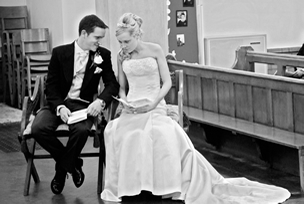 Listed below are a number of questions we are asked about our wedding photography quite regularly. We hope they answer any queries you may have, but if they don't and you need some more wedding photography advice then just drop us a line! Do you ever take more than one wedding booking per day? What products are available in addition to our album? How much 'touching up' is done with digital images? How will our parents and friends be able to choose images or purchase reprints? How long are our images online? Who will be our photographer on the day? What happens, if due to unforeseen circumstances, our photographer is unable to attend our wedding? When do we book extras? Need some more wedding photography questions answered? just drop us a line!